The Stew Beat Showcase $1,000 Grand Finale! 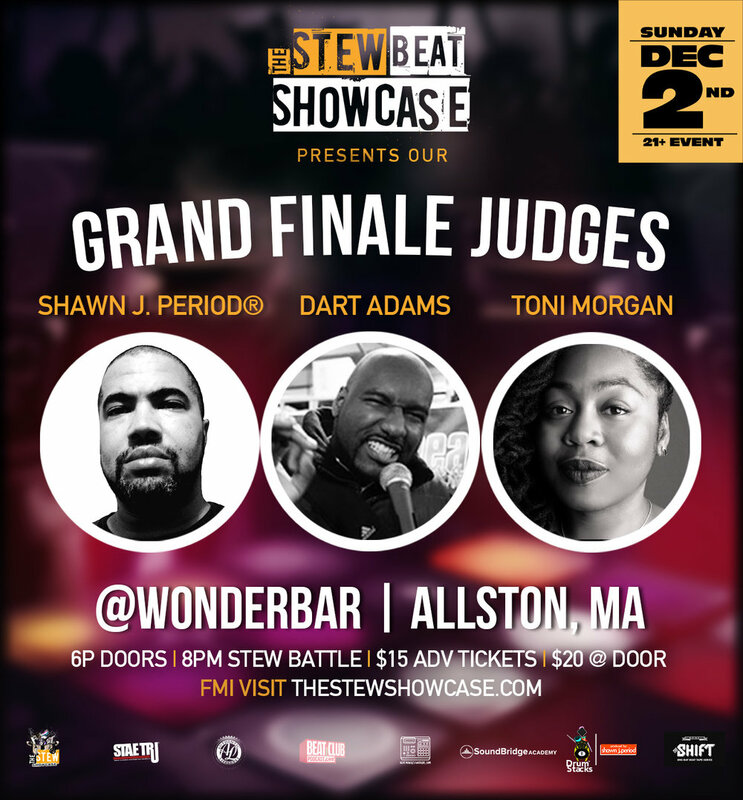 The Stew: Beat Showcase Grand Finale of Season 5 hosted by STAE TRU® and Authentic Lifestyle, goes down Sunday, December 2nd, 2018 at Wonder Bar. Come and witness as we put our 8 top scoring producers from this season in an innovative 3 round beat-battle like no other! Producers go head to head and compose beats live while presented with a variety of challenges all for the chance to win $1,000 cash prize, our championship title and more! So you're a beat maker who just found out about The Stew Beat Showcase Grand Finale and would like to join the competition? Well, you still have a chance. 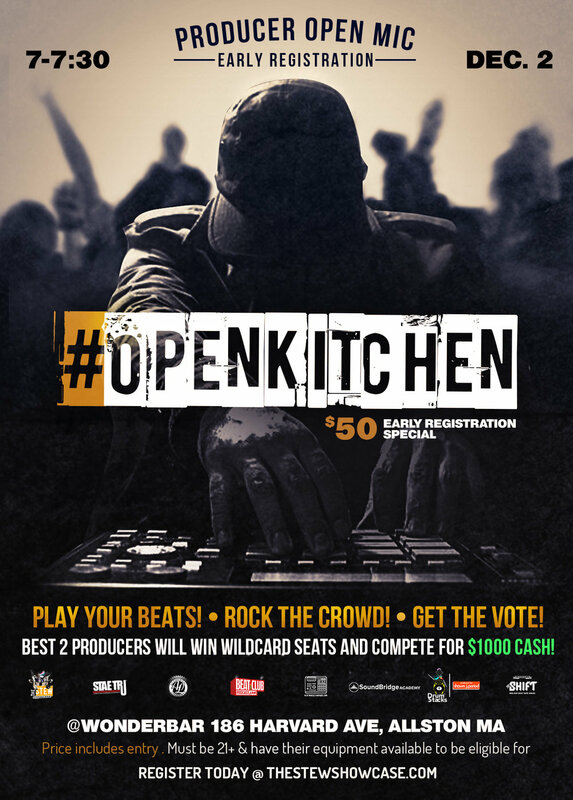 During the The Stew we'll hold an #OpenKitchen (our producer open-mic) where TWO beat-makers will win a wildcard slot on the panel that night for their chance to compete for $1,000. All you have to do is pre-register: REGISTER NOW. Only 5 pre-registration slots will be available at $50. You can also walk-in the day of the beat battle and register but keep in mind due to the Grand Finale the price will be raised. 1. The #OpenKitchen is on a 1st come, 1st served basis. That means register as early as possible or come as early as possible. There will be limited slots for the Open Kitchen during the Grand Finale. 2. The pre-registration fee for the Open Kitchen is $50 (includes the entry). No refunds for no shows. 4. The Open Kitchen occurs before our main event from 7-7:30PM. Participants must arrive at 6:30PM. 5. You will have a 3 minute set to play your beats, rock the crowd & get the vote. Please have your set ready via a MP3 player, mobile device, tablet or laptop. You can choose your beats while in front of the audience to play or have a pre-made set. No elaborate setups needed to JUST play your beats for the Open Kitchen. If you advance from the Open Kitchen that is when you will need your setup to be able to create live. 6. Come with your HEAT! If you rock the crowd, you make it on the panel. If you make it on the panel the first round will be a head to head battle (time beat for beat battle) so make sure you have more than enough bangers available. 1 week away from the BIGGEST beat battle of the year! Major shoutout to our sponsors: Smokehouse Media, Avid Technology, Loopmasters, Plugin Boutique & more. 1. The #OpenKitchen is on a 1st come, 1st served basis. That means come as early as possible. There will be limited slots for the Open Kitchen during the Grand Finale. 2. The registration fee for the Open Kitchen is $100 (includes the entry). 4. The Open Kitchen occurs before our main event of at 10PM. Never attended The Stew Beat Showcase? Check out a couple past recap videos of The Stew Beat Showcase and get a vibe of the atmosphere. Missed our interview about The Stew Beat Showcase on Tuesday? No problem. Take a listen at LFODRadio.com. The Season 2 Grand Finale!